Building a birdhouse can be a fun and useful project for backyard birders even without woodworking or construction experience. The proper tools are essential birdhouse building supplies and can help the house come together well so it will hold up to birds’ nesting use. Choosing the right tools will also help make the house easier and safer to build, letting you create both classic and unique designs to provide birds with new nesting sites in your yard. Before assembling tools for any birdhouse construction project, read the design plans and instructions carefully. Most birdhouse kits or plans will include a list of recommended tools, and reading the steps to build the house can give you ideas about other tools you will need or would like to use. Be sure the tools you select are in good working order and that you know how to use them properly before beginning the project. Hammer: Choose a hammer with a comfortable size, weight and grip for safe, easy use. A nail removal claw on the end of the hammer can be useful for correcting mistakes as you build. Screwdriver: Screws are sturdier than nails for joining parts of a wooden birdhouse, and you will need either a flathead or Phillips screwdriver to match the screws you choose for the project. Nails or Screws: Whichever you choose, be sure your hardware is the right size - diameter and length - to create a strong, sturdy birdhouse. It is also better to use a few extra for additional strength, rather than use too few and have a weak, poorly connected house. Many kits come with nails, but you can swap them out for screws if preferred. Saw: If the wood you will use is not precut, a sturdy saw is essential for cutting the wood to proper dimensions. The saw should be sharp enough for the wood but a comfortable size for easy, safe use. Measuring Tool: To ensure the proper dimensions for your birdhouse, a ruler or measuring tape is necessary. Choose a tool with units that match those given in your plans, either metric units (centimeters) or Imperial units (inches). Be sure the markings are clear and easy to read. Brace and Bit: A brace and assorted bits will help you drill pilot holes for your screws or nails as well as ventilation and drainage holes for a safe birdhouse. Paddle or spade bits are necessary for creating the birdhouse entrance hole unless it is already pre-drilled in your wood. If you are experienced with tools, you can use a power drill, but a hand drill will permit better control for small projects. Pencil: A regular pencil or carpenter’s pencil can be useful for marking dimensions and shapes on your wood to minimize the risk of errors that will waste materials or ruin the project. Safety Glasses: Whenever you will be sawing, drilling or working with wood that may splinter, safety glasses are essential to protect your eyes from dangerous materials. Depending on the type of house you plan to build, materials you already have on hand and what the house plans call for, not all of these tools may be necessary. Having the right tools available, however, will ensure you are prepared for any construction emergencies or alterations throughout your project. If you want to build the best possible birdhouse, these additional materials and tools can come in handy. They may not be specifically called for in your project plans, but a bit of improvisation may be able to improve your birdhouse substantially. Galvanized Hardware: Galvanized screws and nails have been treated to minimize the risk of rust or other wear and will help the birdhouse last longer in all weather conditions. They can be especially useful if you plan to use your house year-round or if it will be exposed to rain and snow as a roosting box. Wood Glue: Adding wood glue along the seams of your birdhouse, in addition to nails or screws, will help seal the house and keep it sturdier even under hard use. The glue can also help insulate the house so it is safer and more comfortable for both adult birds and nestlings. Clamps: Large clamps can help hold pieces of wood in place for precise joints and can keep glued pieces together while the adhesive sets appropriately. Clamps can also work as a second pair of hands to make building the birdhouse easier. Hinges: Adding hinges to your birdhouse can make it easier to open one side, the front or the roof for easy cleaning and nest monitoring. Choose galvanized hinges so they will not rust and loosen over time. Adequate Workspace: A birdhouse may not be a large construction project, but adequate workspace is necessary to spread out your materials and keep track of different tools and pieces as you work. Be sure the workspace is adequately lighted and well-ventilated so the working conditions are safe. 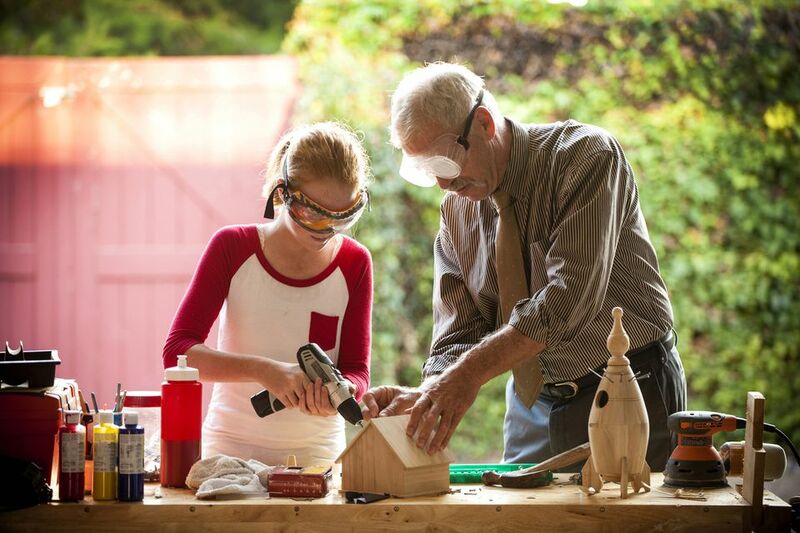 Power tools are not necessary to build a birdhouse, but they can be helpful to make the cutting and drilling steps faster, easier and often more precise. If you choose to use power tools, make sure you are familiar with their safe operation before beginning and always supervise children while the tools are in use. Building a birdhouse can be a rewarding project, both for you and for the birds that will appreciate the snug, safe space to raise their families. By being equipped with the proper tools, the construction project will be easier and the results more attractive, and you may find yourself making many beautiful birdhouses to enjoy.